Taken by amateur photographers, spurred to join clubs by the invention of the Stereo Realist Camera, some ended up in magazines, others in private collections. Betty Page did this kind of modeling (though she is not in any of the pictures that concern us.) These clubs liked to photograph outside, in interesting locations. Our intrepid internet collectors found themselves intrigued by these places, many of which had distinctive features. One in particular captivated them. It was a pool, secured into a hillside with a view of the San Fernando Valley in the background. The pool was surrounded by strange loop de loops of white cement and extravagantly colored tiles, but its most distinctive feature was the mosaic that adorned a retaining wall above the pool. It depicted a large spider in its web, a tiny blip of a hornet caught off to the side. They began comparing photos, especially their backgrounds, to pick out the features that would help them to figure out where the photos were taken. By November, 2004, they had come up with a triangle of likely territory and a couple of locals to confirm the location. Using a telescope, these explorers saw the spider on the retaining wall. 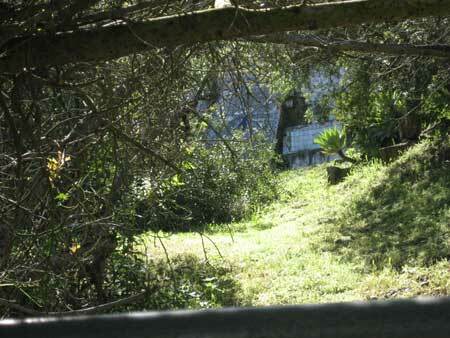 It was on some vacant land, wedged in-between properties. They hiked up a empty lot to get to it. What they found was very different from the glorious pictures they had seen. 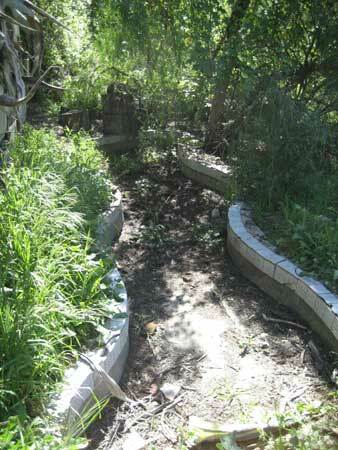 The pool had been removed entirely, due to instability, leaving only a grassy bowl of land near the spider mosaic. Though the white background had been washed away, there was enough contrast to see that the spider, the web and most of the tiles surrounding it were still whole. It was cause for celebration. But what is the Spider Pool? We know about its afterlife, as a ruin and photography club location, but where did it come from? Records of Jack McDermott in Los Angeles date back to his family’s selling dry goods, fresh from the east in 1914. Jack, like any young man in a boomtown, looked to the new movie industry to find his destiny. He started as an actor, but eventually moved behind the camera, with a company of actors of his own. He made several silent films, including Sky Pilot, Dinty and Midnight Madness (he later eschewed directing for writing, where his credits include Blonde or Brunette, Stranded in Paris and The Fifty-Fifty Girl. As his career blossomed, he wanted more than living in a downtown boarding house with other movie types. Eventually he decided that the place for him to build was the bucolic Hollywood Hills. By 1923, he had settled on a pre-1900 foundation. He conscripted set pieces, most notably from the Norma Talmadge flick, Song of Love, which he hauled up into the hills with donkeys and put the house together himself. (Which leaves this writer to suppose that sets were more substantial than they are now, when it seems like just a little moisture will do them in.) It is believed that the swimming pool area (swimming pools were the height of fashion in post WWI LA) was developed at this time. It was built on the crest of the ridge, up several stairs (and possibly a secret passage) up from the house itself. Beyond the Algerian style pieces, he pilfered from other sets, including the sets of The Thief of Baghdad and The Phantom of the Opera. The result was a long, ramshackle dwelling that combined many different styles, not only Algerian, but also Navajo, Moroccan, and Egyptian. The Spider House turned up in numerous magazines, often described as a “crazy house,” a place of debauchery and wonder, full of secret passages, fishponds and even a fake cemetery complete with skulls made of chalk. In 1929, McDermott’s career wound down. Talkies were all the rage and it seemed that he couldn’t gain any purchase as the industry changed. He wrote some minor plays, had some things optioned for features and traveled the world. None of it seemed to make him very happy. He was living in the house in 1946 when he accidentally overdosed on pills. He was dead at 53. He’d left scores of movies and a wonder of a house behind him. In short order, the house burned in a fire, though there are records of people living there after that time. The photographers came and went. Kids moved in to squat and throw parties – much to the consternation of the surrounding neighborhood. In 1958, a man bought the property to try to restore it, but couldn’t get it up to code and was prohibited from having a driveway. The property was abandoned in 1962 and dismantled by the city. I found out about the Spider Pool while roaming the internet one day. Just a line about its discovery. I wanted to see what it looked like, so I followed a link down the rabbit hole. 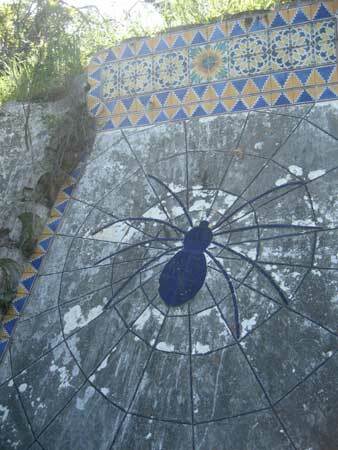 Not only is the iconography – the spider, the wasp, the gorgeous tiles, arresting, but it’s very close to the house my parents were living in when I was born. I had never heard them mention it. I was hooked. I had to see this place. I looked up everything I could, and hauled my (then) fiancé out there in late 2005. Having grown up in rural NY, he was uncomfortable about the possibility of trespassing. I, either out of having grown up in the hills, being used to a lot of trespassers, or possibly just out of sheer stupidity, was unbothered. I was on fire with this place. Getting there was arduous. I left my fiancé and climbed through shrubs and cacti. 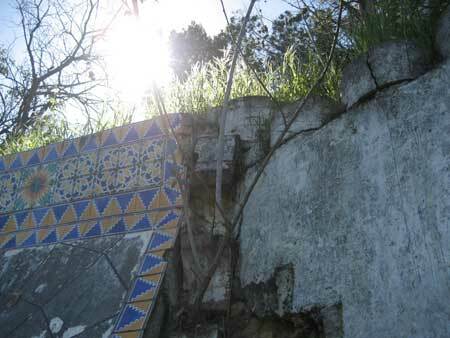 There were no trails, no indicators at all, but eventually, I started seeing tiles – tiles that I recognized! I walked the length of the area, before hitting a wall of cacti. 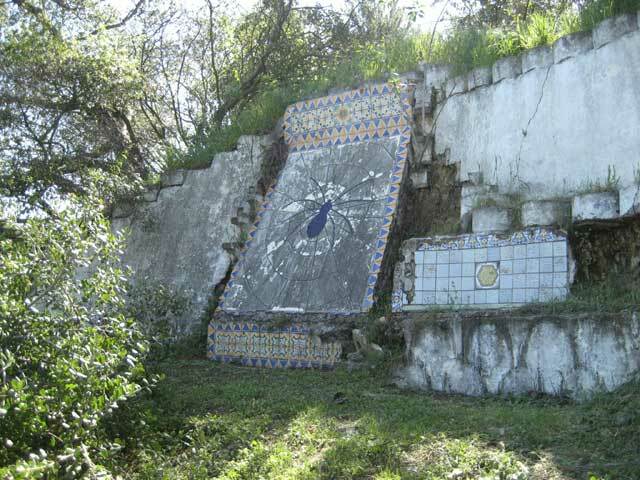 I saw tiles stairs, the outline of a small pool, alcoves in the hillside. But no spider. I couldn’t see the spider anywhere. But I knew I had found something. Weeks later, I found a picture of a woman near the little pool outline. I sent it to an email address, along with a picture of what I had seen. At first, nothing happened. But a few weeks later, I heard back – there was a lot of excitement. Apparently, completely by accident, I had stumbled on the remains of the house. No one had found it before. I was thrilled to be a part of the story that had lit me up. I was glad to contribute to something that had given me so much pleasure. But a couple of years passed, the fact remained. I had not seen the spider. Last month, I packed up a camera, some nuts and water (and a lot of loose clothing) and took to the hills. It was the kind of day LA dreams about -- when everything is perfectly clear and blue and bright. On reaching the area, I drove around a little, trying to figure out which way would give me the best access. Having spotted it, I parked and watched. I was hoping that no one was home. While I may be stupid enough not to care about trespassing, I really don’t like to bother people. I scrambled up the grassy hillside and as it leveled out, I started seeing a lot of weird debris, street signs where there was no street, old trash cans full of tiles (and not the Spider Pool kind.) There were old plants withered in their protective metal trellises. It was a different world – a place where things ended up because they were of no use to anyone. When I reached the next flat part, I looked around. To the right was a house. It was small, not in great shape, but someone was starting to take care of it. To my left was a horse paddock. The notion struck a chord. There was a little shelter at one end and a gate, beyond; it was grassy, sunny and rising. I made my way over. It was just beyond the gate of the paddock that I saw it, the white winking out of the scrubby brush. It was so sudden and such a secret, it took my breath away. It was on the east side, so the sun wasn’t on it, but it shown through the leaves and plants all around, gilding the area. 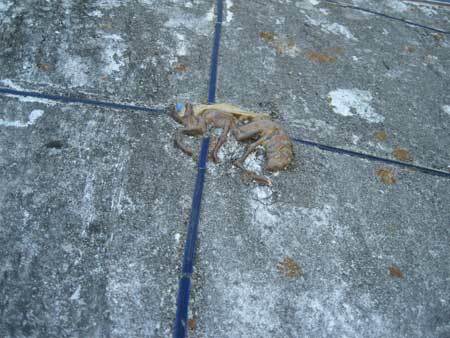 The night cool still rose from the old, large grained cement the spider was in. It was blue – the spider and the web. I hadn’t known that. I sat on the bench that jutted out of the hill and looked out at the living map that had led us all to the Spider Pool. I wandered all over the area, taking pictures, asking myself questions, scrambling over more brush to get down to the house. (It looked much the same, except that it was overrun by nasturtium – a semi-edible plant that thrives in the area. It amazed me how close it really was to people’s houses it was, easily accessible from the driveway of one home. I guess I wouldn’t like it if people wandered around on my property (I don’t think my mom was too big on it when I was a kid) but how could people not want to share this with everyone? I remembered how there had been some talk among the Poolies (as they called themselves) about what it would take to make it a park, but even if there was access, it was too steep. Special thanks for research, photos and enthusiasm to Rowanart and Old Bubblehead.